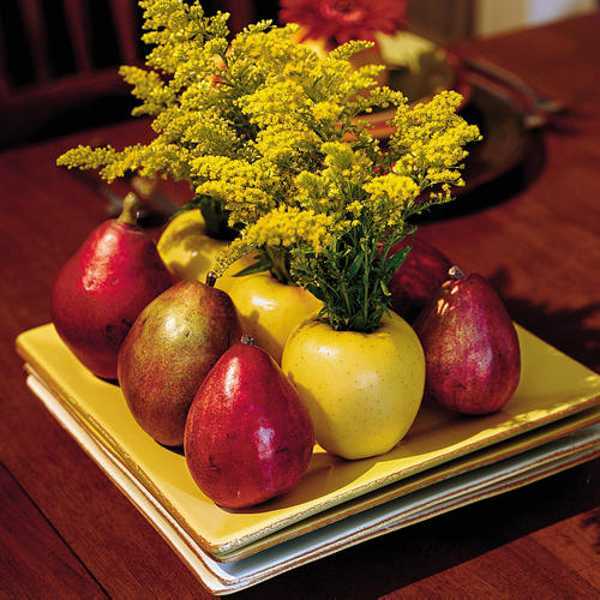 Fall flower arrangements are beautiful, bright and natural Thanksgiving table decorations. Fall flowers bring festive mood and gorgeous rich orange, yellow and red color shades into homes, offering easy to make, inexpensive and impressive Thanksgiving table centerpieces. Autumn flowers are a part of Thanksgiving celebration. These simple and elegant table decorations are versatile and look wonderful in any room, bringing beautiful textures and fresh aroma into your home and symbolizing all of things you are thankful for. Whether you are decorating your home or putting together a thoughtful gift for a loved one, fall flower arrangements are an appropriate, elegant and pleasant way to give thanks or to send thank you messages. Rich orange, golden yellow and harvest red color shades feel exciting and warm, adding energy to your fall event or Thanksgiving table decorating. Deep and light purple, orange, yellow and red color shades, combined with stunning fall leaves or beautiful hips, fruits and vegetables, make all simple fall flower arrangements look stunning. Bring these harvest colors into your Thanksgiving home decorating this year with beautiful fall table centerpieces to celebrate your personal events and Thanksgiving holiday in style. 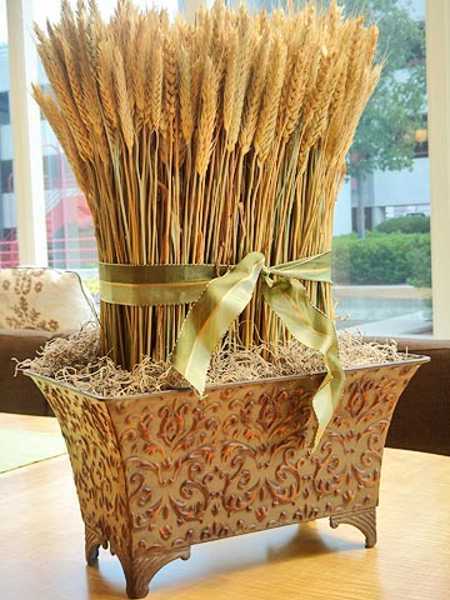 Rake in an abundance of warm smiles with bought or homemade flower arrangements overflowing with beautiful fall flowers and blooming with harvest accents. Canadian Thanksgiving holiday is on the second Monday in October. The fourth Thursday in November is Thanksgiving holiday in the US. Traditional Thanksgiving table decorating is about delicious food and bright table decorations, like flowers, berries, hips, fruits and vegetables harvested in fall. The Thanksgiving table decorating tradition goes back to a story of New England Pilgrims celebrating their first harvest in the New World with the local Native Americans who had helped them survive through winter. The real roots of the Thanksgiving holiday goes back to the earliest harvest celebrations. The most important element of Thanksgiving celebration is the feast, – turkey with a special stuffing, mashed potatoes with gravy, yams, corn, pumpkin pie. Gorgeous and bright, optimistic and colorful fall flower arrangements make party table decor look even more attractive, inviting and delicious. Fall flower arrangements, combined with autumn leaves, hips, fruits and vegetables, are great table decorations for many occasions, including birthdays and anniversaries, Thanksgiving holiday and Halloween party. 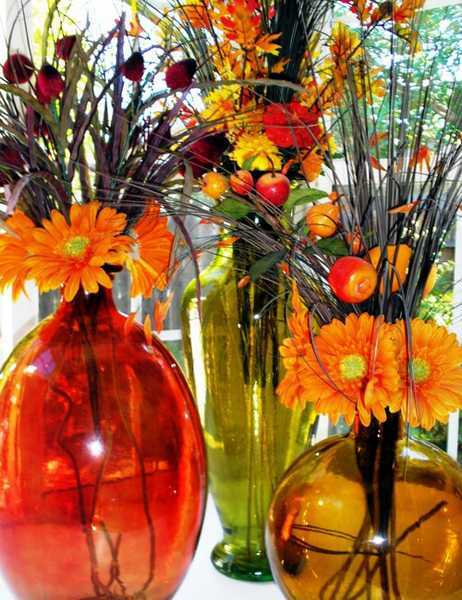 Fall flower arrangements in orange, yellow and red color shades, that incorporate pumpkins or black-n-white cat vases, plates, bowls and mugs, are excellent ideas for Halloween table decorating also. Fall flower arrangements add the natural beauty to Thanksgiving table decorating, complimenting the delicious Thanksgiving meals you prepare, impressing your guests and establishing an atmosphere of relaxation and joy. 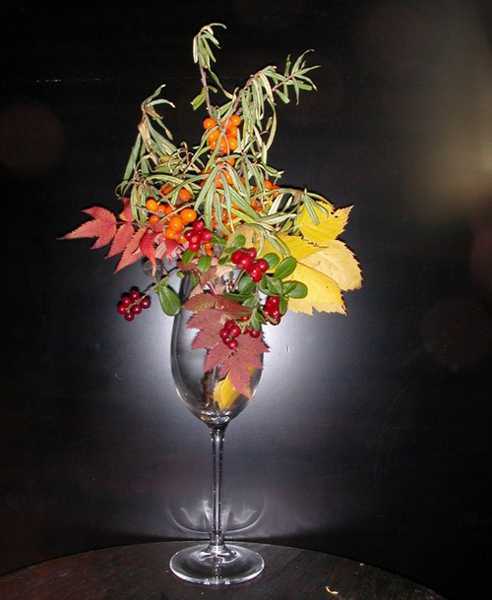 Fall flower arrangements with wild rose hips, fruits, vegetables, rowan-tree berries and fall leaves make very personal, creative and striking Thanksgiving table centerpieces and home decorations. Also fall flowers are a great gift for the host if you are going out. 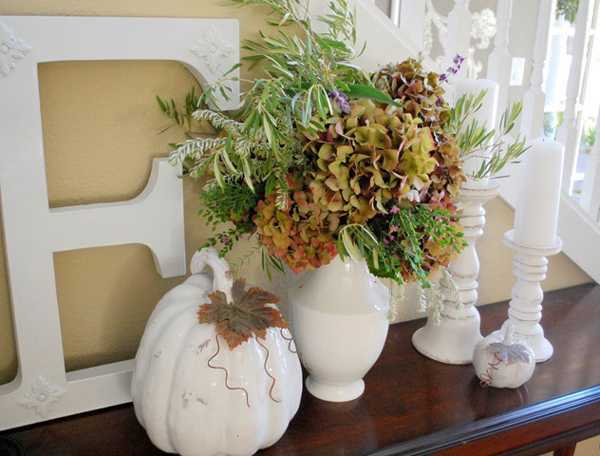 Floral arrangements are a nice way to say Happy Thanksgiving to family, friends, neighbors and business associates. Thanksgiving floral arrangements make excellent Thanksgiving decorations for the dinner table and are a growing tradition that you should be sure not to miss out on. Thanksgiving table decorating with a floral arrangement enhances the spirit of your home and the appearance of your dining room.